An outstanding athlete coming out of college (he was a champion hurdler as well as football star), Woodson was chosen by the Steelers in the first round of the 1987 NFL draft (10th overall). He held out and got a late start in the strike-interrupted ’87 season, and was used as a nickel back and kick returner, but swiftly developed into a star at cornerback and was team co-MVP in 1988. Woodson was a consensus first-team All-Pro and went to the Pro Bowl for the first time in ’89. With his outstanding speed, leaping ability, and body control, he became a regular Pro Bowl participant through 1992 and was again a first-team All-Pro selection in 1990 and ’92, a season in which he recorded a career-high six sacks and 100 tackles. He also compiled 20 interceptions in his first six years, led the NFL in kickoff returning in 1989 (27.3 avg.) and ran two kickoffs and two punts back for TDs. Steelers went 9-7 to finish second in the AFC Central and qualify for the postseason as a Wild Card. Lost AFC Wild Card playoff to Kansas City Chiefs (27-24). In 1994, Woodson was again a first-team All-Pro for the fifth time in six seasons and was selected to his sixth straight Pro Bowl. But it appeared his career might be over due to a severe knee injury suffered in the first game of the ’95 season. 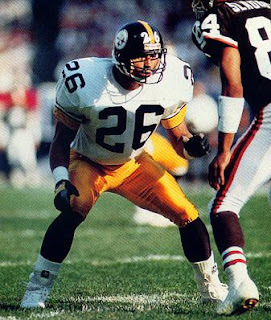 Remarkably, he returned to play for the Steelers in the Super Bowl following that season and was again selected for the Pro Bowl in 1996. He moved on to the 49ers in ’97 and then to the Baltimore Ravens in 1998, where he was shifted to free safety in ’99 and played well enough to once again gain selection to the Pro Bowl. It was the first of three straight such selections with the Ravens, who also won the Super Bowl following the 2000 season largely due to their outstanding defense. With the Raiders in 2002, Woodson was a consensus first-team All-Pro for the sixth and last time, and also went to the Pro Bowl for the last of 11 times at the age of 37. He finished up with Oakland in 2003, having intercepted 71 passes, the third most in NFL history, 12 of which were returned for touchdowns, a league record. Woodson was inducted into the Pro Football Hall of Fame, Class of 2009.